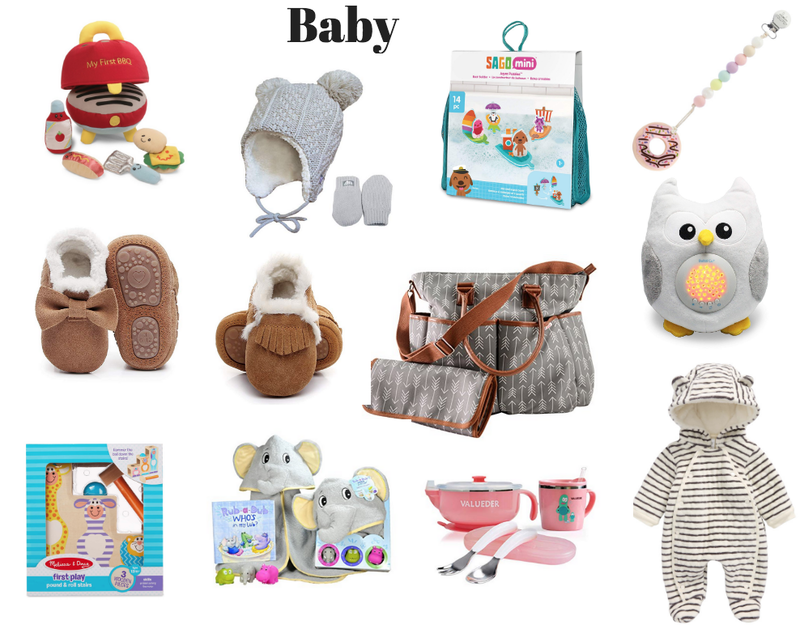 Okay y'all, I am embarrassed to admit how much time I spent on today's gift guide, but trust me, it was a lot of hours :) I love looking up all the latest baby gadgets and the coolest toys, but it sends my brain into extreme hyper-focus mode. Before I know it, half the day has gone by, and I'm still over here looking at baby fur moccasins, the coolest 3D wooden puzzles, and trying to decide which color purse my niece would love the best...haha! But the good news is, in my hours upon hours of searching, I am confident in saying that I found some of the BEST gifts for babies and kids of all ages!! - Out of all the baby plush cuteness I've ever seen, this little grill set takes the cake! I think this would even make a good gift to give to the expecting father to be! - Cozy knit tie beanie and gloves that are pure baby perfection! They also have a 5 star review and are only $31!! - I remember Carson and Taylor loving these little foam bath toys, and even if they're not old enough to actually play with them, they love holding them. - I mean, where were these adorable teethers when my babies were tiny!? - I can't even handle the CUTENESS of these leather fur baby moccasins. And I love that they make them for boys with the loafer look and the baby girls with the sweet little bow. - I love that this diaper bag looks like a stylish handbag, but it has every organizational pocket that all mamas needs along with a matching changing pad. - A sound machine and a nightlight that is portable...I swear, we may buy this for travel purposes and our kids at age 9 and 6...haha!!! - I love the little baby wooden toys, and as babies, our kids were all about anything they could smack on and and watch roll down a hill. - Seriously the best bath set ever for a newborn or a toddler. It comes with a large hooded elephant towel, an adorable elephant book, and three of cutest little animal water squirters I've ever seen. - This is is most genius travel feeding set I've ever seen. It comes with a temperature control bowl so you can defrost your baby food while out or cool down anything that comes out too hot. This is perfect for taking your baby out to restaurants or for travel. - Nordstrom baby makes clothes that feel and look almost identical to Kissy Kissy (one of my favorite high-end baby brands), but for a fraction of the cost. And this cozy hooded bunting is so cute and perfect for this cold weather. - Playmobil makes the best blocks for little ones, and I'm not going to lie, they're so much easier to keep up with and clean than regular Legos! 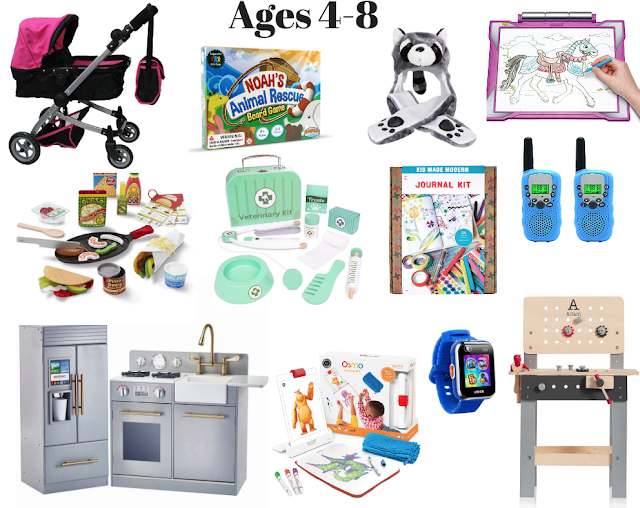 - This is such a great gift and one that is great for learning, but is also fun for play. - Okay, these foam velcro blocks may just be the coolest thing ever for little ones. And I love that all the different shapes and animals are all interchangeable so the kids can really use their imagination and build all sorts of things. - Is this hedgehog not the cutest riding toy you've ever seen?? Also, all the animal riders are handmade, they have four multi-directional casters making it easy for toddlers to move around, and they are great for building motor skills and balance! - Bath toys always make a great gift, and I love that this one interacts with the water and allows the child / toddler to "wash away the dirt" on the duck. - Melissa and Doug truly make the best toys that last forever and I don't know of any little boys that wouldn't love this car garage with a gas pump and moving elevator. - Cutest little wooden dollhouse right along with the most precious mini wooden kitchen I've ever seen. 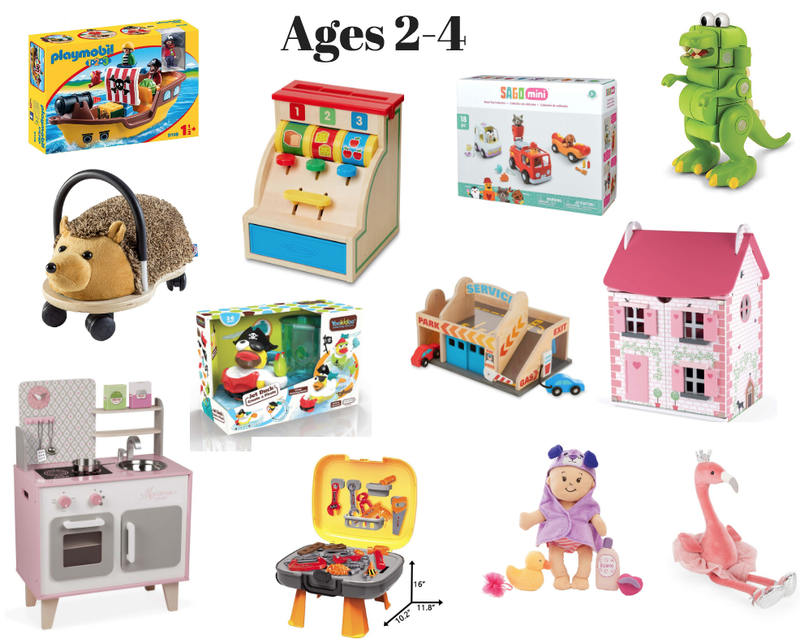 Both of these are great for little ones, and for people who don't have a lot of space or just don't want big pieces like dollhouses or play kitchens taking up too much space in their home. - I just ordered this little workbench for my two year old nephew for Christmas and I have a feeling he's going to love it. It has a solid 5 star review, and it comes with 36 tools and pieces. Another added bonus, it can be folded up for easy storage or for travel. - If you guys have never checked out Manhattan Toys, then please do that now. They make some of the cutest baby dolls I have ever seen, and I love that they are all super soft and all have little magnetic pacifiers! - What little girl doesn't love flamingos? Plus, this one was just too cute with her tutu and ballet shoes! - Taylor has this exact stroller (in a different color) that we bought her for Christmas two years ago and she still plays with it to this day. The quality is unbelievable for the price! - This looks like such a fun game that kids can play with their parents or alone with their friends. The best part is that it teaches your kids teamwork and they win the game together instead of having an individual winner! - Okay y'all, Taylor is obsessed with these animal 3-1 beanies. We bought her one at Disney and now she wants three more for Christmas. Praise that I found them on Amazon for less than half the price at Disney...ha! - This is such a great gift for any kid that loves art and drawing. Taylor will be getting one of these from Santa for sure. - Pretend play is so big at this age, and this is the cutest little wooden Veterinary Kit I've ever seen. Plus, it would make the perfect gift for a boy or a girl. - Another gift that is perfect for a girl or boy is this super cool make your own journal kit. 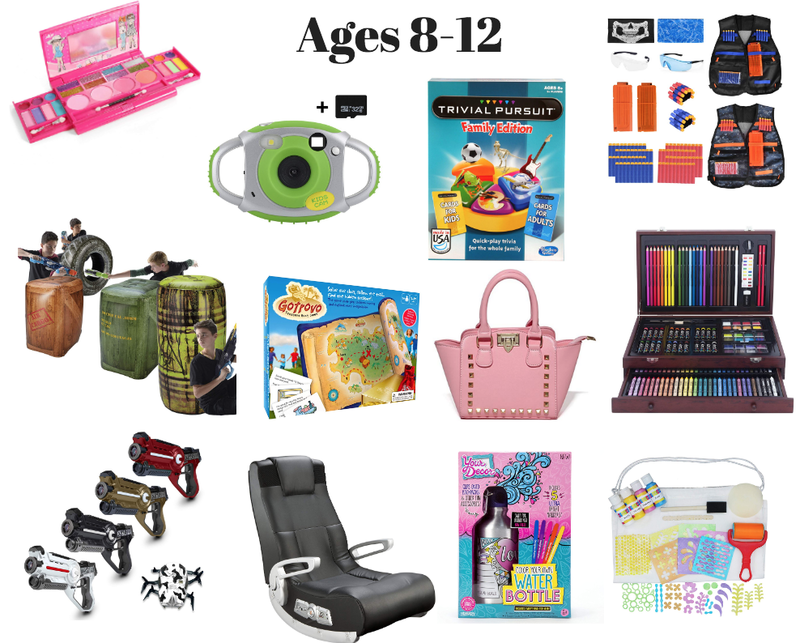 - Walkie talkies are always so fun, and these have awesome reviews and also have a 3 mile range for kids to use outdoors. - Hands down the most fabulous kids kitchen ever! Move over Pottery Barn Kids, Amazon has you beat with this $144 modern set! - This is such a cool iPad device that gives your kids hands on learning. And I love that kids can bring their art to life with the awesome interactive. - This smart watch is such a great gift for kids who are starting to learn how to tell time. It also provides them with entertaining games and a built-in camera! - Pottery Barn Kids get the win on this one, especially since they just marked it down to $76! It's such a nice looking workbench and one that your kids could grow with for many years. - This make-up palette is perfect for little girls who want to play with make-up, but aren't quite ready for the real thing yet. - This camera and camcorder looks awesome for kids really wanting to learn how to take pictures and videos. And I love that the outer case makes it durable in case they drop it or are a little rough with it. - We love playing family games around here and this one looks like it would be a blast. And it's one that even the older kids can really get into and have some fun! - These awesome laser guns and these Fortnite bunkers will both be under the tree for Carson this year! If you have boys between the ages of 6-13, I think these will be a huge hit. - This scavenger hunt game is another one that looks so fun for kids of all ages, and it would be great to play at a birthday party since a lot of kids can play at once. - Okay, how amazing is this little rock stud pink purse!? I think I may have to get Tay one. - How awesome does this wooden art set look!? This is a gift that I know Taylor and Carson would both love to receive, and added bonus, it's on sale right now!! This acrylic paint set looks pretty cool as well, maybe for the older kids that are a little more advanced. - At this age, I was really into anything art and everything DIY, so I think both this DIY stainless steal water bottle set and this DIY drawstring bag kit would makes awesome gifts!